Immediately knowing what‘s going on. 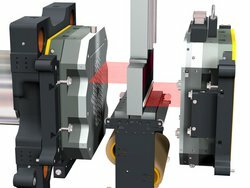 The trend-setting DESMA MoVis system is directly integrated in the injection moulding machine. The 3-D mould surface scanner thus permits a monitoring of the demoulding process and an optimization of the mould service life already during the injection moulding process. Up to now, it was only possible to carry out these inspection and control functions subsequent to the injection moulding process or downstream of the injection moulding machine. DESMA MoVis thus provides for increased safety and productivity during the manufacture of rubber and silicone products.